ANNAPOLIS, Md. — Jake Willis of Calvert High School (Prince Frederick, Md.) is the 2017 Ronald B. Majette AAU Maryland Baseball Player of the Year, as announced earlier this week by the Maryland district of the Amateur Athletic Union of the United States© (AAU). The award distinguishes Willis as Maryland’s best AAU high school-eligible baseball player. Willis is the fourth AAU Maryland Baseball Player of the Year to be chosen from the 19U Maryland RBI advanced skills development team. The 5-foot-10, 150-pound senior shortstop led Maryland RBI to an 18-0 record in AAU Mid-Atlantic Wood Bat League play and a fourth Maryland AAU championship. Willis was two years younger than most of his teammates, most of whom play college baseball. Undeterred, Willis progressed with skilled play and determination. After a few games, he was a shining talent in the league. Playing shortstop he hit 5 doubles, 2 triples, with a .442 batting average, .500 on-base percentage, .615 slugging percentage, scored 26 runs, drove in 19 RBIs, and collected 12 steals. Willis provided a high level of consistency and production all season, making him Maryland RBI’s nominee for the district honor, which was earned last year by South River’s Brad Marceron (South River HS, Edgewater, Md.). 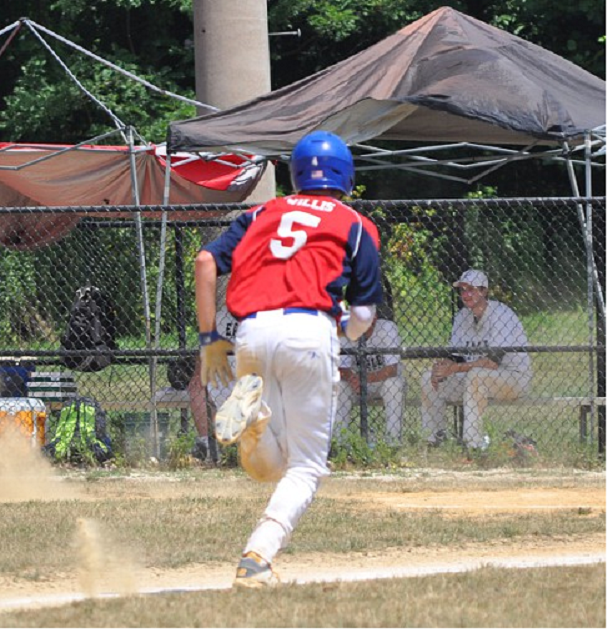 “It’s an honor to announce Jake Willis as the 2017 Ronald B. Majette AAU Baseball Player of the Year,” said Mike Graham, Maryland RBI general manager. “He’s smart and creative in his game, and an intuitive player in all phases of the sport. He brings his entire team up with his significant effort and positive attitude. Willis began his senior year of high school this fall. He joins an elite alumni association of recent past Maryland RBI players as the award’s winners, including Brandon Snow (Riverdale Baptist HS, 2012), Billy Albaugh (Southern HS, 2014), and Connor Graham (Northern HS, 2015). The selection process is administered by the Maryland district of the AAU to determine the winners in each AAU sport, including baseball, basketball, cheerleading, football, golf, jump rope, martial arts, swimming, volleyball, and other sports. The Maryland AAU Baseball Player of the Year is named in memory of Ron "Mojo" Majette, for many years the leader of Fort Washington (Md.) area youth baseball, including AAU, Big League and Little League teams. The honor is presented each year. Willis guest played several years with Maryland RBI before playing full time in 2017. Willis credits his dad and mom for their continued support as well for where he is today and where he is headed in life. His sister played college softball. Willis will receive the Majette award from Maryland AAU Governor Ben Dubose in Baltimore at the Annual Maryland AAU Outstanding Athletes, Coaches and Volunteers Sports Awards Banquet in November.